Blimey, it's been over a year since I've written any articles here, or anywhere else! I haven't felt inspired until now, today, when I saw the above image that encapsulates the raw and pure beauty of what a zero-compromise race tuned kart does. That picture contains everything you need to know about driving the most perfectly adapted racing machines on the planet - the 100cc racing kart. These are the only machines in existence that can connect you to the art of driving so directly, without numbing your senses or protecting you from the brutality of the insane revs and vibrations that bruise and deafen you. It's all there in a finite moment - the delicate balance of braking and slide, the sheer grip trying to pull the front tyre off the rim and the slight over-steer angle betrayed by the middle spoke of the steering wheel. You know he is moving fast, the pull on the tyres show you that, but you also sense the poise of the driver from his posture. He is fully in control and put the kart in that position with confidence. You also sense that despite the angle of the kart seeming to point at the steep kerb, that he will have that front left tyre describing a perfect arc around the base of the kerb without upsetting the stability of the machine one iota. You can see where he is, and you know where he is going without the need for correction or reaction. He's going to carry that slide all the way to hit a late apex, and the kart will straighten up and pre-load ready for the following right hander.... it's all in balance and harmony. Assuming you would like to emulate this artful way of driving a kart, here's how you can do it. Master the art of trail braking for maximum style points. Ollie Scullion is superb on the brakes, especially at putting the kart into a slide when he firsts hits the brakes and holding that slight angle as the kart enters the corner. He does it in the photo at Fulbeck into a tricky little chicane and into tight hairpins elsewhere with seemingly little effort. It's mesmerizing to watch, and despite having worked with some of the best karters in the world I still marvel at the guys who can do this, lap in lap out. I haven't worked with Ollie myself, and am just an admirer of what is to me the most entertaining aspect of watching drivers at work. The key to getting this skill is in appreciating the importance of how to release your braking pressure as you enter a corner. You need to lock the rear a little when you first hit the brake, which is the easy bit and amply described in previous articles of mine. But the tricky bit is regulating the brake after that initial lock up. When you get into trail braking you might find at first an overriding temptation to release the brakes suddenly to bring the kart back into line. However if you want to hold that slight degree of slide all the way into a late apex so you look like an seasoned pro, you'll need to learn how to resist that temptation to suddenly get off the brake. Instead, practice gently regulating the braking pressure just enough to maintain the angle of the kart. Release the brakes too much and you will straighten up requiring you to steer the kart into the corner. Use too much brake and you'll need extra opposite lock leading to some ugly angles caused by the extreme geometry built into karts. 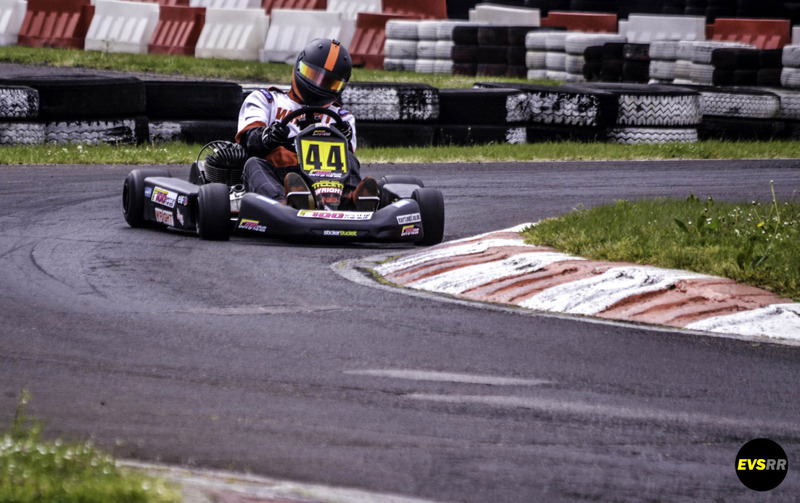 You need to find a sweet spot, where you will be able to directly control the angle of the kart with your left foot. You might be making multiple tiny adjustments of pressure to hold the kart at an angle, or you may be able to hold the pressure almost constant. When you get the hang of holding a kart at an angle using braking pressure, you will feel like the kart is saying 'yes!! this is how I want to be driven'. Karts love to be put in a set like this and they will reward you with a lovely sense of constant grip and stability, and will guide you through a corner without drama.......if you let it. 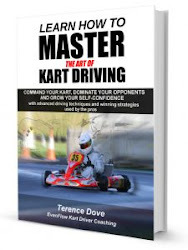 It is not easy at all, in fact I think it's what separates a good driver from a master so it will take time and patience - but when it clicks you'll be buzzing like never before in a kart. Understand the hidden benefit of trail braking with style. These days on 'modern' karts there is no great requirement to brake so stylishly. You can brake in a straight line mostly, and carry your braking gently into an apex without having to set the kart into any kind of over-steer. However, if you learn to trail brake and hang the rear out ever so slightly you can develop a heightened awareness of pre-loading a kart, and ultimately push the development of your senses beyond those of other more regular drivers. You'll be able to extract that little bit extra out of your kart because you will have developed a finer sense of grip and an ability for timing that isn't normal, it's extraordinary. Learning how to initiate the turn in of a kart aiming at a late apex not by steering more, but by holding onto the brake while the front tucks in is a special skill well worth learning. In my opinion this will set you a cut above, even if you don't exercise this skill every time you drive a kart. And by the way, if you want to taste karting in its ultimate form head over to the F100 website. Big grids of karts from the sport's pinnacle era. True no limit karting is alive and kicking.